Inspired by the lovely rosé color and tingling sensation of bubbles, Blushed compels you to embrace your colorful nature. It is a festive and fun bubbly made for any celebration. Flavor and Aroma: Fresh strawberries and pomegranate complemented by a crisp dry finish. Enjoy this wine with an assortment of appetizers, salads and mild to medium cheeses. 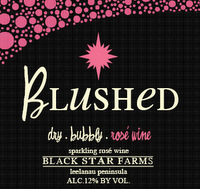 Blushed is new to our line of bubblies and is one we have created to be easy on the palate and enjoyable for many. We made this rosé style sparkling wine from 100% Pinot Noir. The classic fruit characteristics of this varietal are prominent in this wine along with a subtle toastiness in the finish. Do not let the rosé color make you think this is a sweet wine as it is truly an off-dry sparkler. Pop open a bottle on your next celebratory occasion or simply when you are looking to enhance an ordinary day.